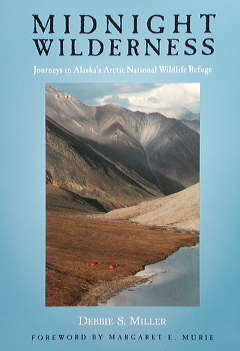 Debbie S. Miller has written one of the best, if not the best, descriptive books on the Arctic National Wildlife Refuge, and it is certainly the most enjoyable that I have read. Debbie has real world years of feet on the ground experience in ANWR and her book will impart to you her passion for a place of moving beauty. I’ll let her introduce herself in her own words (http://www.debbiemilleralaska.com/). Midnight Wilderness is a book to read if you want to know what the fuss is about with regard to drilling ANWR. http://www.debbiemilleralaska.com/MidnightWilderness.htm. It is available on Amazon of course. Just got back from Denali NP and Denail State Park so I have a lot of catching up to do. I have a ton of photos to go through; I will put some up asap. This entry was posted on Monday, June 1st, 2009 at 2:22 pm	and is filed under Anything But... and tagged with Alaska, ANWR, Arctic, fall river photography, Midnight Wilderness. You can follow any responses to this entry through the RSS 2.0 feed.